Is your automatic garage door opener not opening your garage door? Is the light on your existing opener just blinking, do you hear noises, but nothing happens when you push the button to open the door, or is your door only opening part way then closing again? We can help! 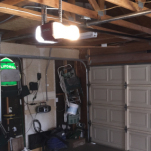 LiftMaster/Chamberlain automatic garage door openers are our #1 product recommendation for new garage door openers! We have sold and installed hundreds if not more of them, giving us the hands-on knowledge and awareness of their premium quality, value, and durability. All LiftMaster models we offer our customers are a full-package deal that package includes: 1 remote, 1 wall mounted switch, 2 safety sensors, all mounting hardware, and a solid one piece rail. That solid one-piece rail is only available when you purchase LiftMaster garage door openers through KJ’S Garage Door Repair. The LiftMaster models we offer can range from the most basic chain driven to highly advanced, quiet wall-mounted versions. Features with each model can range from basic chain drive to super quiet belt drive, smartphone enabled, LED lighting, battery backup, and more. 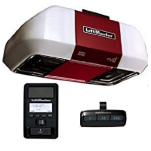 Purchasing a LiftMaster garage door opener from KJ’S Garage Door Repair gives the consumer professional contractor-grade equipment, improved garage security, and peace of mind. 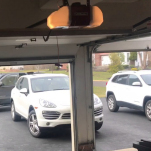 Moreover, every purchased and installed LiftMaster garage door opener comes with a full 5-year warranty on materials and a 6-month warranty on installation. KJ’s Garage Door Repair Company is fully licensed, bonded, and insured. Call us to schedule an appointment today for new garage door openers, service repairs, and even complete replacement garage door installations. You will be glad you did!